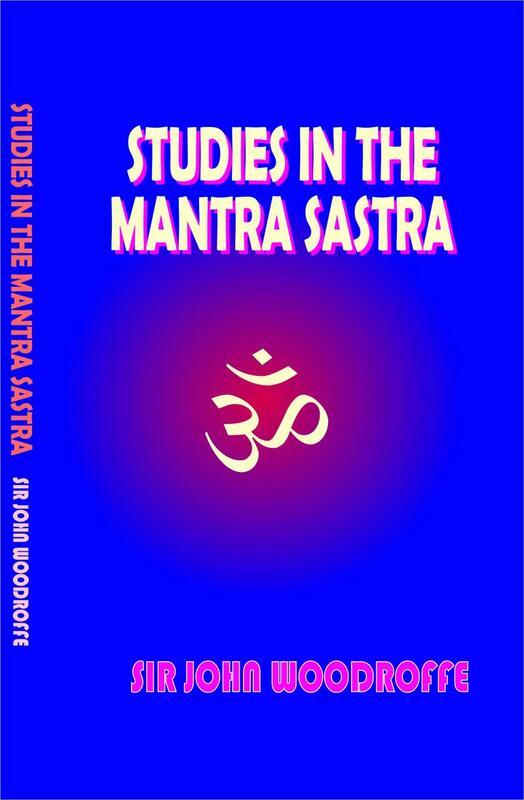 This book is an attempt made for the first time to explain the intricacies of Mantra Sastra. The Mantra sastra is worthy of a close study which when undertaken, will disclose elements of value to minds, free from superstition of metaphysical bent and subtle seeing - sookshma darsana. A prfound doctrine, ingeneously though gaurdedly set forth, is contained in the Tantras of the Mantra Sastra, or Agama. The Basal principles are as old as the Upanishads which proclaimed that all was Chit (consciousness). This book is a collection of Essays upon particular subjects in the Mantra sastra , a term which is commonly applied to the Tantra Sastra. The Book is practically composed of two parts. The chapter one deals with the Word, chapters 2-9 treat the Principles of general doctrine of Sabda. Chapters 10-21 are elucidations of some subject in Tantra sastra which adopts the Mimasa doctrine of Shabda and some modifications to meet its doctrine of Shakti. Chapters,22,28,29 deal with the Mntra OM and Gayatri. The other chapters brings an understanding of the such terms as Shakti, Sabda, Bindu the causal Shaktis of the Pranava, Bija Mantras and so forth. These are essential to the understanding of the Mantra sastra. The chapters of Gayatri and Mantra sadhana elucidates the intricaciesof the Tantras and Tantrik rituals. 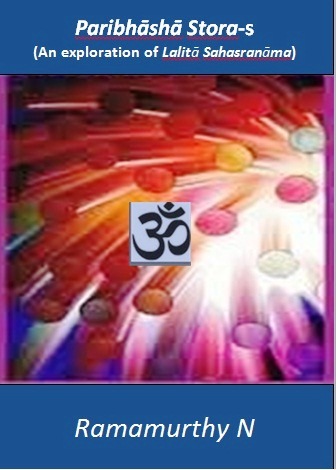 The introduction in this chapter gives the fuller account of the Atmasadhana and its importance. 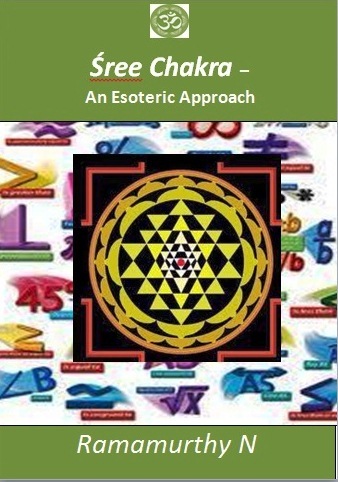 An essential book to understand the basic principles of Mantra and as applied to Tantra. This translation of Brihath Jathaka by N Chidambram Iyer has been long out of print and not many know of this commentary. The interesting part of this commentary is that he gives the meaning of the verses and then adds his own notes on the text. At some places these are extensive. Also he has converted these text into modern mathematical models in degrees and minutes and has attributed the data to degrees and minutes. Also he has compared the indian system of nomenclature to western system as well. The appendix to the translation contain numerous tables and diagrams relating to the construction of horoscopes. 1.Definitions and Elementary Principles (Zodiacal), 2.Definitions and Elementary Principles (Planetary), 3.On Animal and Vegetable Horoscopy, 5.On Matters connected with Birth Time. 6. On Balarishta or Early Death., 7.On Ayurdaya or the Determination of the Length of Life., 8. On Planetary Divisions and Sub- Divisions of Life Known as Dasas and Antardasas., 9.On Ashtakavargas, 10.On Avocation. 11.On Raja Yoga or the Birth of Kings., 12.On Nabhasa Yogas, 13.On Chandra (Lunar) yogas, 14.On Double Planetary Yogas.,15.On Ascetic Yogas. 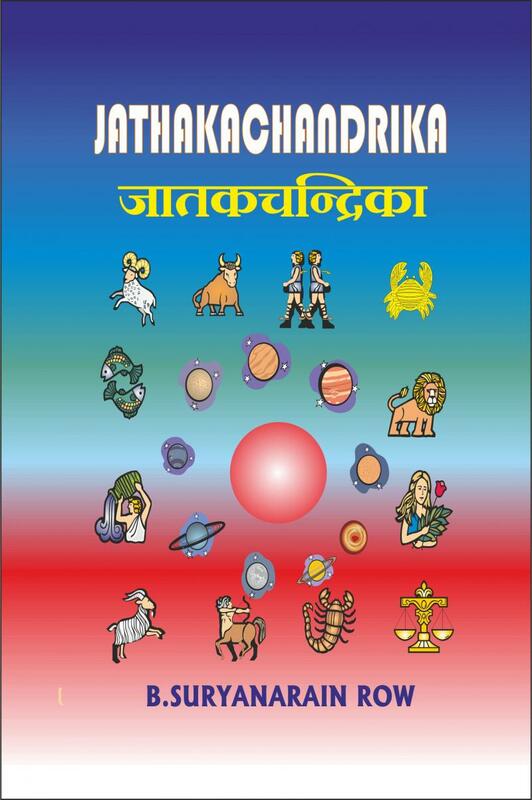 22.On Miscellaneous Yogas., 23.On Malefic Yogas, 24.On the Horoscopy of Women., 25.On Death, 26.On Lost Horoscopes., 27.On The Drekkanas., 28. Conclusion. PRASNA JNANA by Bhattotpala, the illustrious commentator of Varahamihira. 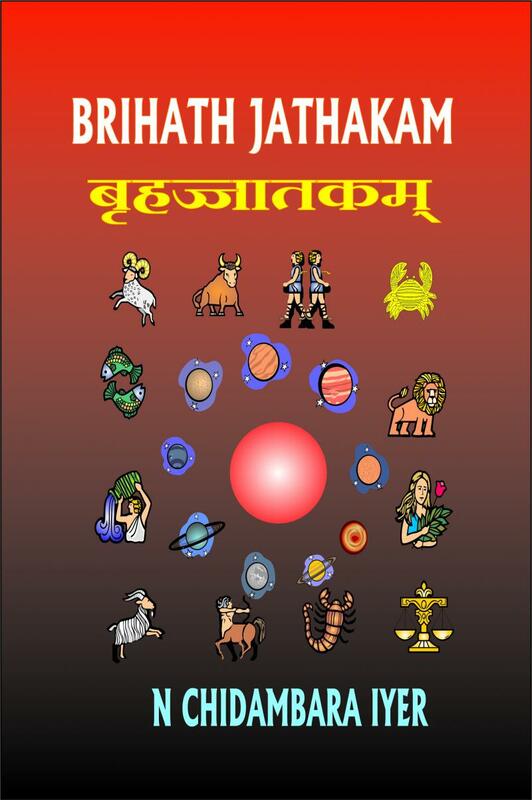 Bhattotpala, He is also the author of several works on Astrology, including The Shatpanchasika, another interesting work on the horary aspect of the science of Astrology. 4) Illness, 5) Marriage, 6) Pregnancy,7) Food, and Dreams, 9) Rain, 10) Nature of Queries, 11) Theft and 12) Method of finding Lagna. The author gives many new ideas on such as dreams and food, Omens etc. 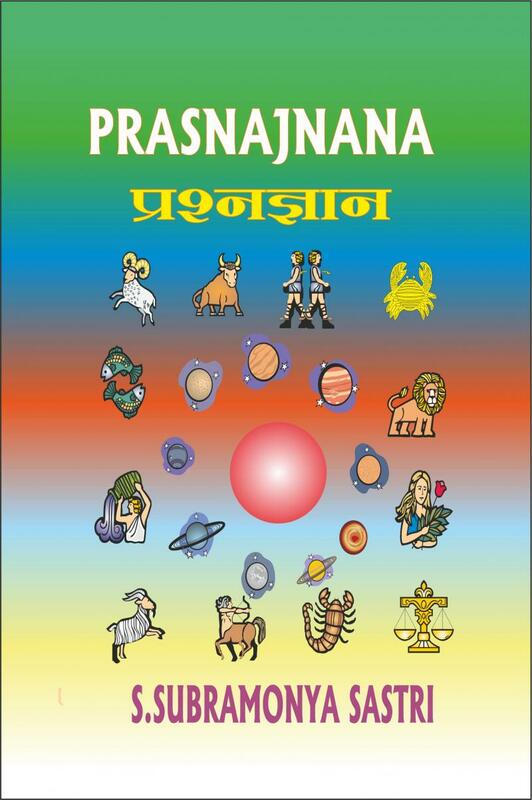 The Present work Shatpanchasika in an important work for the learning of Prasna sastra, one of the branches of Jyotisha. The Author Prithuyasas the son of Varahamihira has condensed in 50 slokas several aspects of query, the prasna sastra, one is prompted to study every sloka. The subjects covered in the seven chapters are General Principles, Travelling and returning, success and defeat, auspicious and inauspicious symptoms, queries about one abroad, recovery of the lost, and miscellaneous topics. 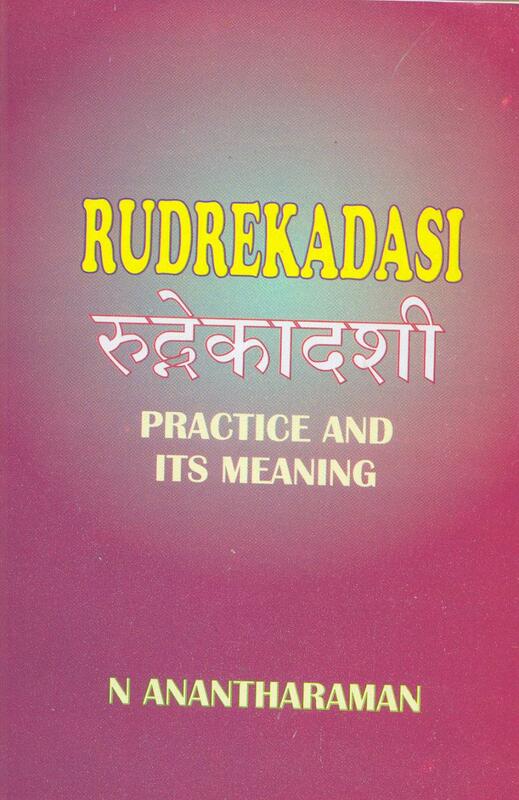 The book contains the Sanskrit text of the Shatpanchasika with the meaning of the sloka in English and commentary. The highlight of the book is detailed commentary on drekkana swaroopa to ascertain the character, direction, and details of the recovery of the lost materials and other aspects. Silparatna, the authentic work on construction, iconography, Indian art, and allied matters, relating to temples, pagodas, and human settlements. This is a highly useful work for those interested in iconography and Indian architecture. The science of silpa founded by Matanga, Bhrugu and other hoary sages are elaborately delt. Important information has been collected by the author srikumara from the vast silpa literature. This work has been reprinted from the edited versions of ancient palm leafs dating from 1600 A.D. The vast literature and tradition as existed and applied for construction of temples, palaces, has been well preserved through these palm leafs and this text is an essential reference source for temple architecture. This work in original palmleaf written sometime around 16th century is an excellent source for hitherto unknown concepts of iconography and architecture. This is a rare work and no similar work has ever been published. Originally published in the Trivandrum Sanskrit series, in 2 volumes has been long out of Print, and is now being reprinted for the use of scholars and practioners of Indian architecture and iconography. the commentary in Sanskrit by Sree Bhâskararâya. The objective of publishing this book is to propa­gate devotion on God and teachers among all. We request our teachers, who always bless us in a subtle form, to make this goal fulfilled. We request all the readers to read this book and become eligible for the limitless compassion of Úree Râjarâjeshwaree. We seek Œree Lalitâ, to bestow her blessings, matured knowledge and great wealth to all those who have worked hard to bring out this book successfully. 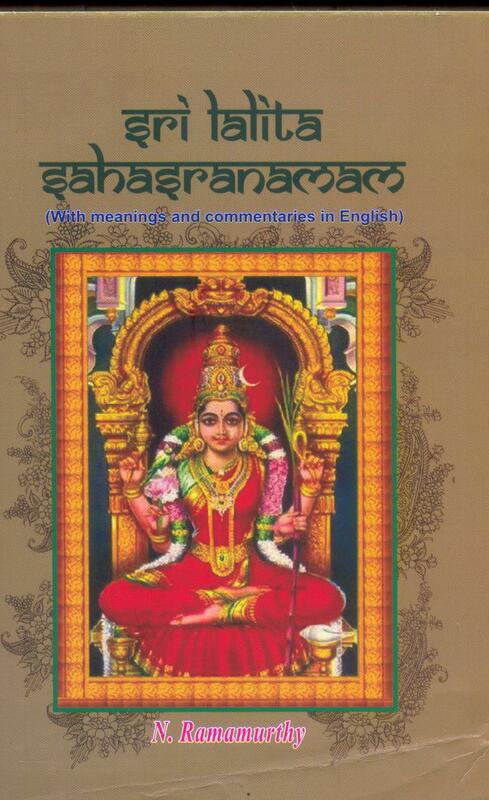 The commentary on Sree Lalitâ Sahasranâmam has come in search of your house. ﻿ The best feature of this book is that every name is compared with the corresponding meanings/ analogies in 20+ Upanishads, various mantras, Brahmasûtram, Devee Bhâgavatam, Mahâ Shodaanyâsam, Nityâ Shodashikârnavam, different Sutrâs, Shiva and other Puranas, Soundarya laharee, Sree Durgâ saptasatee, Sree Lalitâ Trisatee, Sree Lalitopâkhyânam, Sree Varivasyâ Rahasyam, Sreemad Bhagavad Geeta, Sreevidyâ saparyâpaddhati, Sruti and Smrutis, Vishnu Sahasranâmâ and what not. The introduction and study part of the present work is unique and gives more details about the work and its implied meanings – not usually found in other publications. It is aimed at common audience and not necessarily scholarly readers. This book helps the readers, to clearly understand the meanings, traditions / methods of performing worship, etc., in simple English. It also elaborates the details about Devee worship, Sreechakra, Sreevidyaa, etc. Especially the Paribhaasha verses are astonishing ones– the way they explain the unique method of splitting the verses into names. 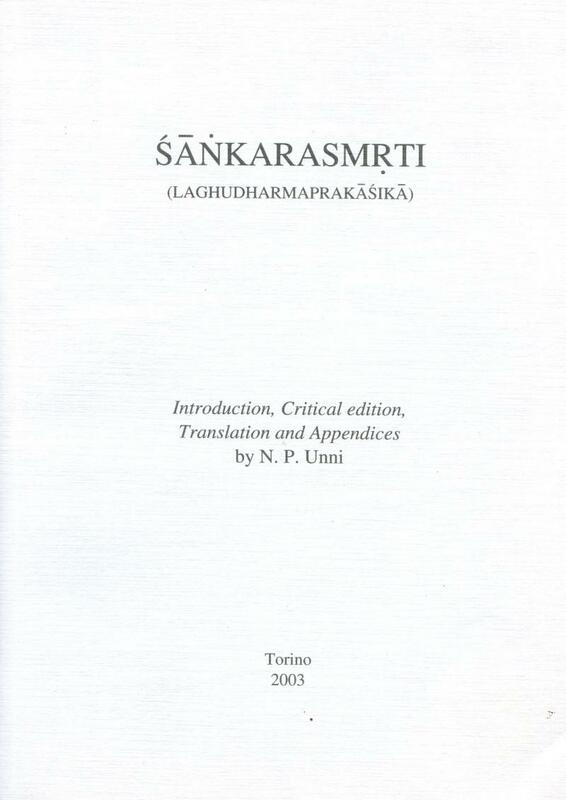 The original Tamil edition, written by learned scholars, Sree S.Gnapati Subramanian and Sree M. Sundararaman of Gnana Bhâskara Sangam, at the behest of their Guru (Sreemati Prakaasambaa Sametha Sree Chidânanda Nâtha), was first published in the year 2000. Through discourses, by the blessings of teachers and Sreedevee, from 1982 onwards, every Sunday, in Sree Gnânabhâskara Society about various books on tantra, mantra, sâstra and commentaries on Vedas, followed by Soubhâgya Bhâskaram of Sree Bhâskararâya in detail in Tamil. Since then it continued to have increasing popularity among the Tamil-knowing public especially those who have passion towards religion. Among the names Lalita is the best. Among the mantras Sreevidya is the best.And in Sreevidya the Kadividya is the best. The Sreepura is the greatest among the cities. Among Srividya Upasakas, Paramasiva is the eprime devotee. One is attracted to Srividya only in his last birth. those who take to this worship will have no more births, It requires an extraordinary merit to get initiated in Sreevidya. No one can attain Siddhi without the help of Srividya. 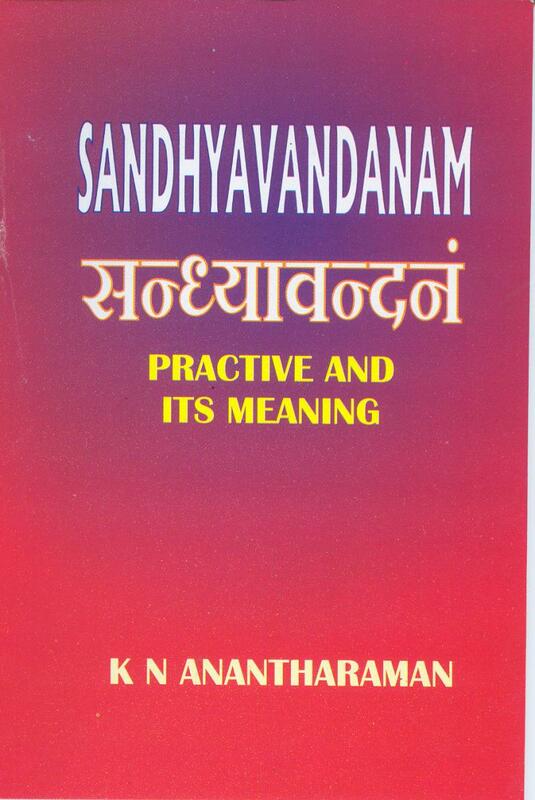 This book delves into the intricacies of the Sreevidya Upasana and an introduction to the practice of Sreevidya. This book Paribhāshā Stora-s is a rare attempt in the history of the human mind to make use a sort of Indian Mathematics with Samskrit, representing numerals through letters and words. Before discussing the Paribhāshā Stotra-s per-se, an introduction to Katapayādhi andBhoota Sankhya methods are provided so that the beauty of Paribhāshā Stotra-s treasure can be appreciated and enjoyed. It is not a surprise that we have some commonalities between Lalitā Sahasranāma with Soundaryalaharee and Saptashatee, since all the three are on Shree Devee. But the other two Viśṇu Sahasranāma andShree Bhagavad Geeta are about/ on different God(s). But still we have lot of similarities in names, functions, characteristics, etc. 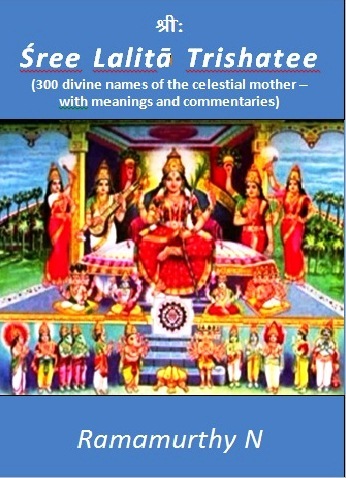 In this book, every name is compared with the corresponding meanings/ analogies in 20+ Upanishads, various mantras, Brahma Sūtram, Devee Bhāgavatam, Mahā Shoḍanyāsam, Nitya Shoḍashikārnavam, different Sūtras, Shiva and other Purāṇas, Soundaryalaharee, Shree Lalitā Trishatee, Shree Lalito pākyānam, Shree Varivasyā Rahasyam, Shreemad Bhagavad Geeta, Shree Vidyasaparyapaddhati, Srutis, Smrutis, Viśṇu Sahasranāma and what not? 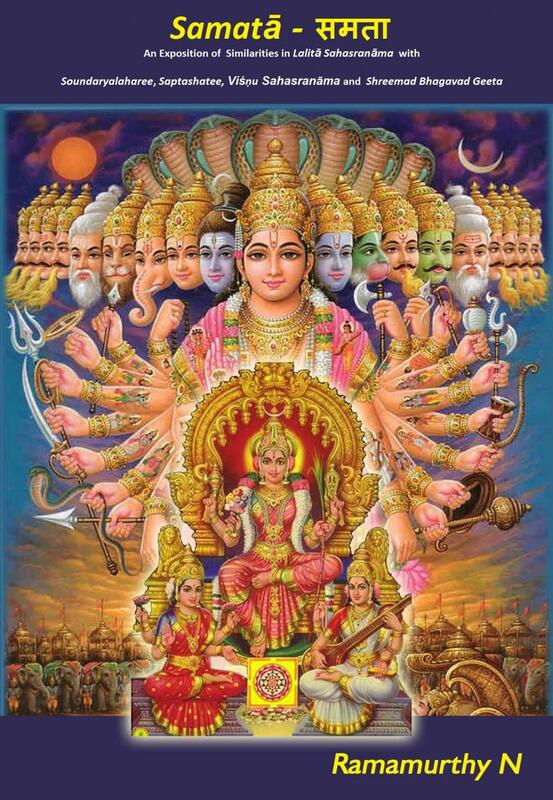 ﻿Sri Ramamurthy has vividly brought to light, the deeper meaning and purport of the major texts of these two sects namely Soundharayalaharee, Devi Mahātmeeyam and Lalita Sahasranāmam on one side and Vishnu Sahasranāmam and Bhagvat Geeta on the other side in order to establish the underlying oneness and resolve all conflicts. He has established that Jnāna Yoga and Bhakti Yoga complement each other. There is a general feeling that Śree Lalitā Triśatee is difficult to chant or read. But it is not really so. Out of the three stotras Śree Lalitā Triśatee is the most sacred and result oriented, since it is Sarva Poorthikara Stotram. Also it encompasses Pancadashāksharee mantra itself in it. Reading or chanting or simply hearing this stotra or performing archana using the 300 divine names will fetch enormous results as desired by the devotees. But still the results will be multiplied and also the errors or mistakes will be reduced if it is done after understanding the meaning of the names – not only the apparent meaning, but the inner meaning or tatvas represented by each name. Another benefit is – understanding the meanings would enable the worshippers to focus more on Śreedevee and meditate upon Her. The commentary is mainly based on Śree Ādi Śaṇkara’s commentaries on Lalitā Trishatee. Vedic Mathematics is not only a sophisticated pedagogic and research tool but also an introduction to an ancient civilization. Rooted in the ancient Vedic sources which heralded the dawn of human history and illumined by their erudite exegesis, India’s intellectual, scientific and aesthetic vitality blossomed and triumphed not in only in Astronomy, Arithmetic, Geometry, Algebra, and Various Sciences, but also in Philosophy and Performing arts. Vedic Mathematics was intro-duced to the world community around 50 years ago, has found a lot of potential and wealth in it. With more and more excavations in this subject, quiet a lot of complicated calculations/ appli-cations are made simple and easy. 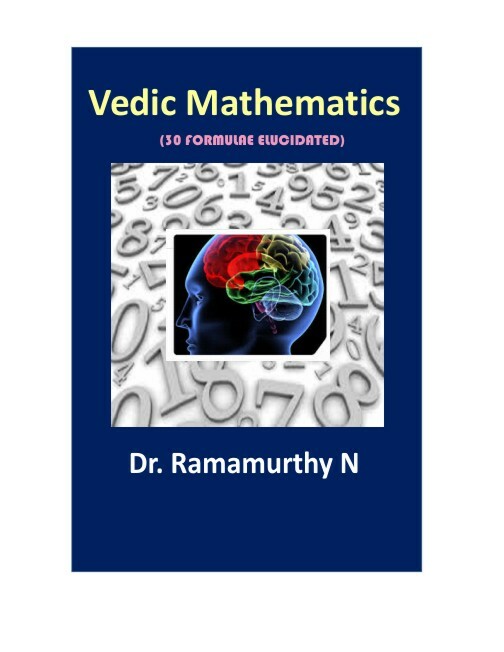 It is seen in any standard book on Vedic Mathematics the different types of problems are considered and solutions provided using one or more of the formulae or corollaries. However, in this book each of the formulae/ corollary has been individually explained with example(s). This makes this book a unique of its kind. 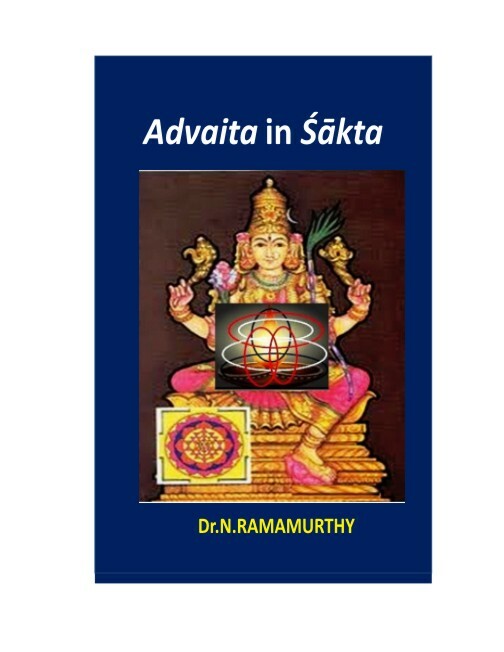 This book tries to address the advaita principles in sâkta religion, the Advaita as expounded by Sree Âdi Sankara in all his teachings, works, discourses, etc. ‘A’– none, ‘dvaita’ – dual – Advaita means there is no-two or non-duality. This theory was propounded and globalised by Sree Âdi Sankara. He also established the Sakta, six sub-religions of Hindu religion. Sâkta – the worshipers of Sakti, is one of those six sub-religions. Here an overview has been made taking into consideration three texts viz., Lalitâ Sahasra-nâma, Soundaryalaharee and Saptashatee. See Kânchi Kâmakoti Paramâchârya’s talks have been taken as primary input for this book. This introductory book on Chandi yagna deals with the benefits of the yagna, as it can aid in clearing off the obstacles and hurdles on the path to success. Goddess Durga, the chief deity of this yagna will gift the performers with the power to balance the passion and dispassion, indulgence and denial. She is the primordial energy that is responsible for the creation, sustenance and destruction of this entire universe. She is the sum total of the energies of all beings of this universe. The Chandi Yagna and the Deity - Chandi is a very fierce and powerful deity. By performing the Mahaa Chandi Yagna, one can become free of evil eyes, curses, obstacles and they are also blessed with a lasting health, wealth and prosperity. Vedânga Jyothisa says - “Like the crest of the peacock, like the gem on the head of a snake, Mathematics is at the head of all knowledge”. Mathematics is an integral part of Vedas, whose origin is yet to be clearly specified. The Contributions to the world of Mathematics by Indian Mathematicians like Pingala, Âryabhama, Bhâskara, Brahmagupta, Kâtyâyana, Mahâvîrâcârya, Mâdhava, Srîdharâcârya, and Bhârati Krishna Teerthaji Maharâj in modern times are very great. They introduced the concepts like the place value system, importance of ‘Zero’, etc. 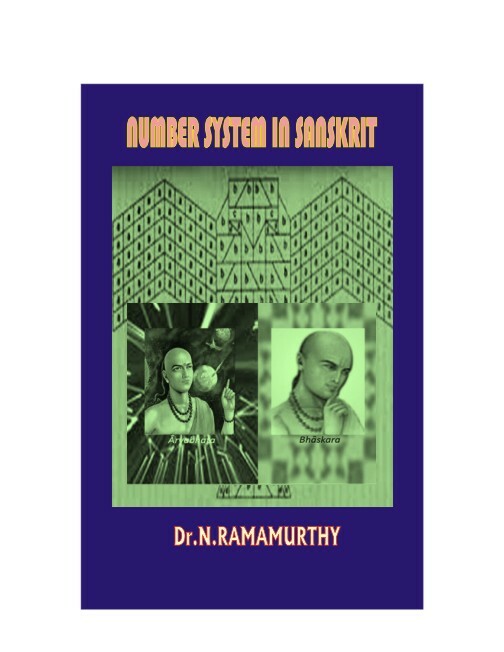 They used different systems to represent numbers – the major three systems are Kamapayâdi Sankhyâ, Bhûta Sankhyâ and Âryabhatîya Sankhyâ. These system of numbers were used to represent mathematics through poetic words – dual expertise. It is an ocean. This book tries to bring out a drop from this ocean. About the Author :Shri N Anatharaman was an erudite scholar who read widely the Hindu scriptures and explained them in simple language to reach out to larger audience. His mission in life was to relive the Indian culture and scriptures in the hearts of the people. For this he strived tirelessly throughout his life, more so after retirement from Government service. About the Book: Adi Sankaracharya is said to have lived during early 8th century A.D. He was born in a small village known as Kaladi on the banks of Poorna River in the present Kerela state. But for the great interest and dynamism of Sringeri Mutt Sankaracharya Late Sri Narasimha Bharathi, who was able to locate the place where Sankara was born, the present Sarada Temple and Sankaracharya temple in Kaladi would not have come into existence. 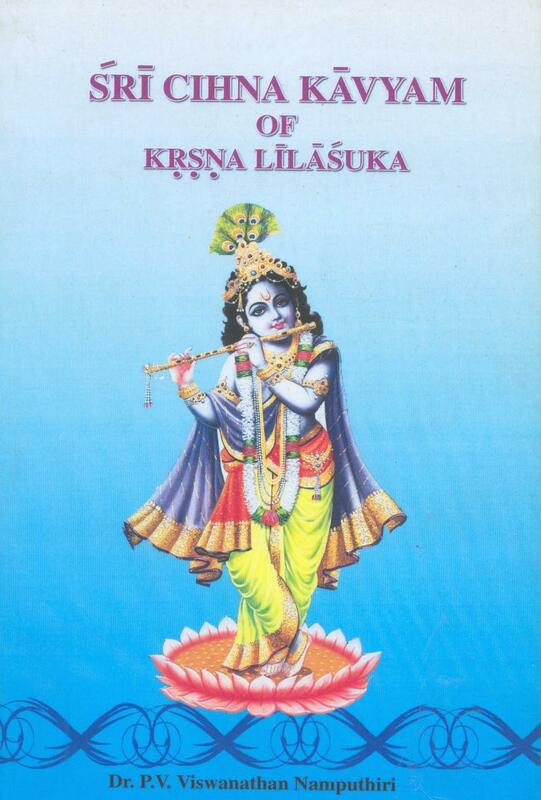 The present edition of Srichinna Kavyam of Krisna Lilasuka is also known as Govindabhisheka written by Sage Krishnalilasuka alias Vilvamangalam swamiayar. 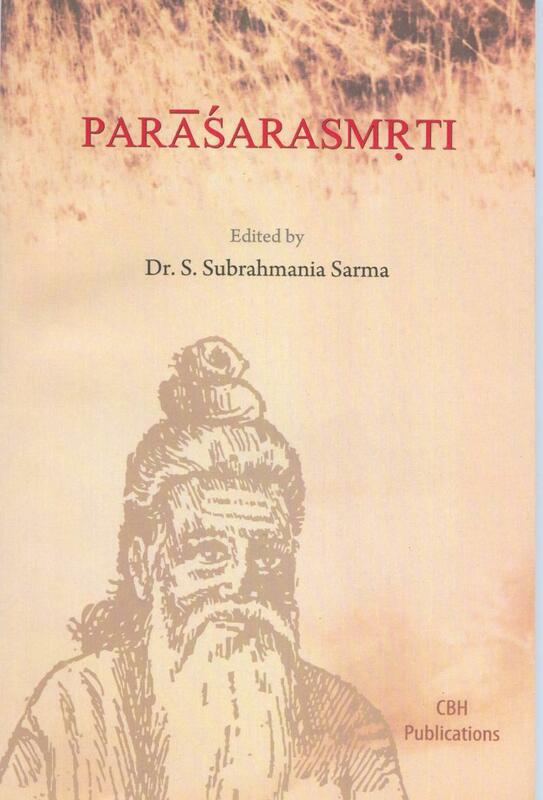 This book was composed in Prakrit to illustrate the Prakrita sutras of Vararuci and Prakrit grimmer of trivikrama. In this edition the author has attempted a critical study of the whole poem which formed the basis of his doctoral dissertation. The whole work is known as srichinna since last stanzas o all the 12 cantos the word Sri is used. The disciple also wrote the a commentary on the whole portion known as Bhaktivilasa. Dr.P.V.Viswanathan Naputhiri took his Masters degree in Vyakarana and then M.A.in Malayalam from Kerala University. In 1992 he was awarded the Ph.D . He joined the department of Sanskrit in Baselius college, Kottayam. Contribution of Sanskrit to the Smrit literature is vast and all pervasive. The terms is generally applied to Dharmasastra. The works reflect the belief and practices of people and have influenced the writers and common man. There as difference of opinion about number of smritis. Among the writers Parasara and Yanjavalkya stand out. 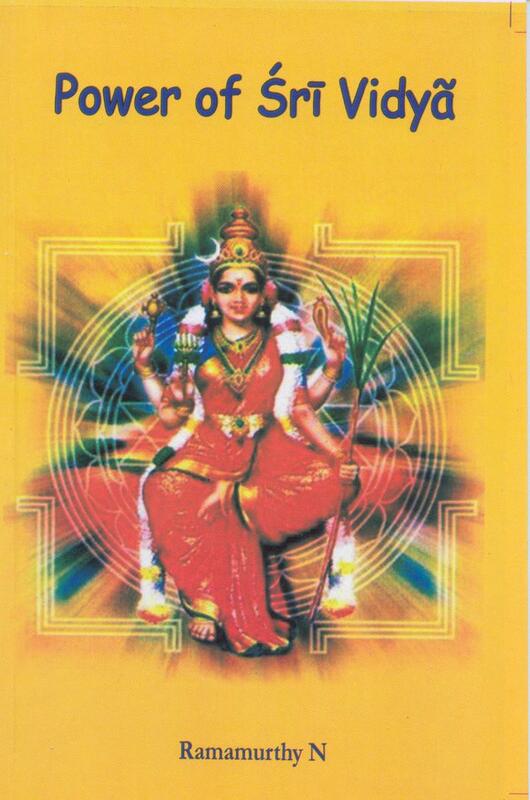 In this edition the commentary of Madhavacharya and is known as Parasara Madhaviya. Dr.Subramonia Sarma obtained his doctoral dissertation from Rashtirya Sanskrit Sanstha. He continues teaching at the Rashtriya Sanskrit Sansthan from 1989. 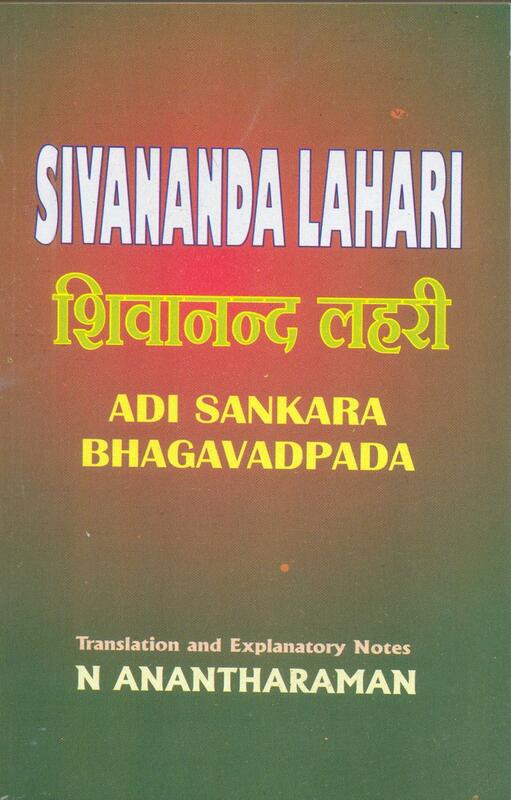 Sankara Smriti alias Laghudharmaprakasika is a 14th century text dealing with the social religion and cultural customs peculiar to Kerala. In 12 chapters each divided in 4 padas (section) it deals into many peculiar items on dharmasastras such as origin of the varnas and their duties, types of marriages, rules for smearing ashes, the sixteen customary rites, matrilineal systems, smartavicara (examination of girls with suspected adultery with detailed proceedings, duties of various casts, pollution of different kinds, the 64 anacaras, extraordinary customs peculiar to Kerala etc. The text contains 1376 stanzas and is critically edited using 10 palm leaf manuscripts. It is printed in roman script with English translation, explanatory notes bibliography, glossary, index of half verses. Dr.N.P.Unni has been the first scholar awarded a Ph.D in Sanskrit by the University of Kerala. After a long teaching career in the Government Sanskrit college, Trivandrum he joined the University of Kerala as curator in the reputed Oriental research Institute and Manuscripts Library. Later he became the Reader on Sanskrit in the department of Sanskrit. And from 1979,onwards served as Professor and head of the department. He was appointed as Vice chancellor of the Prestigious Sree Sankara University, Kalady for a term of 4 years. In 2001 he was awarded the meritorious Certificate of Honor by the President of India. Dr.Unni has written, edited, published more than 40 books in different fields of study in Sanskrit. Each year more than hundred Ph.D Degrees are awarded and more than 200 topics registered for Ph.D degrees in 80 and odd Post- graduate Departments of Sanskrit in our Indian Universities. A great deal of money and time is spent on research in these departments, But it is painfully observed that when one is half way through the research he realises that either the topics is already worked upon or some also is also working on the same topic. This situation compells one either to change the topics or ignore the fact. Change of topic means loss of time, energy and money. Maintaining silence regarding contemporary research amounts to literary deceit. The main reason for this sorry state of affairs is that there is not comprehensive guide to research work done in different Indian Universities. Keeping in view of the above felt need, the author has compiled in this volume a comprehensive bibliography of all doctoral dissertations submitted in all Sanskrit Departments and accepted by Different Universities since 1857 to 1988. in India,. The Bibliography contains more than 2500 entries arranged in different sections. Each entry contains, the tile of the topic, Name of the scholar, language of the thesis if other than English, Translation of the title in English, The year in which the same was presented/the degree was awarded, Name of the University etc. The topics of the research has been arranged in different sections as given blow for the easy location of the subject of interest. An exhaustive Index of the author and volume makes it easy for location of the subjects. As a tool of research this bibliography will be of much use to all institutions doing research in Sanskrit. A scholar will be able to know whether a particular topic has already been under taken for research. Also This will be an important tool for research for Students of Sanskrit Research in that they will be able to trace out the dissertations of their interest and make better use of earlier research done on the subject of interest. This can also be used as an information tool for further research in the selection of new topics.An Essential book for all Research Departments of Sanskrit, Indology and to those who are working in Sanskrit. This edition of Nanaratharnavasamshepa is a lexicon based on early palm leaves. The Nanartha words or homonyms with their different lingas are arranged in this work in six kandas. The first kanda contains words of one syllable and second kanda two syllables and so on. Each kanda is again subdivided into five adhyayas namely strilingadhyya, Pullingadhyaya, Napumsakalingadhyaya, vachyalingadhyaya, and nanalingadhyaya and so on. for facility of reference the words are all arranged in alphabetical order in each adhayaya. The work treats of several words not fond in Amarakosa and other common lexicons. The author is noted by Mallinatha and also by Arunachala in their commentaries on Maha kavyas. The long out of print work is now reprinted in one single volume comprising all the three parts. An extremely useful book for grammarians and linguists and sanskrit scholars alike. This important commentary on the Kasika has long been out of print and now has been reprinted containing the three parts in one single volume. The present work named Kasika is a commentary by Upadhyaya Sucharitamisra on the Mimamsaslokavartika. Of the two system of MImamsa philosophy viz Karma Mimamsa and Brahmamimamsa the first is dealt with by Jaimini is 12 adhyayas containing 2700 sutras. The extant Bhashya on these sutra is by Sabarisvamin and Bhatta Kumarila’s elaborate material commentary on the first pada known as Tantrapada of the first adhyaya of the bhasya is called sloka vartika on which the kasika now offered is a learned and dignified commentary. It has not been possible to ascertain the date of Sucaritamisra but this much is known that he flourished earlier than 1350.